A completely balanced coil configuration produces great harmonics and a high output with just the right blend of sustain and distortion. You get the best of both worlds: from sweet warm tones to raw rock 'n' roll. Combine this with the (SH-2) Jazz Neck and you've got Seymour's personal favorite combination. "I am not sure why anyone would use anything else." Sound: There are a lot of pickups out there and let's be honest, sound is objective. However, it is tough to argue the perfect ammount of breakup and gain this pickup has is top notch. Feature: You can get it in multiple colors, and I like that they make a 'trem version' in the TB-4. Some pickups don't have the trem or Fender spacing option. 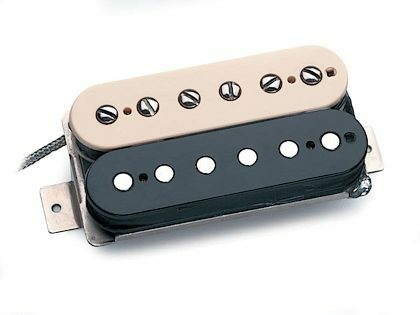 Ease of Use: Well...it works just like any pickup - it just sounds better when doing it. Quality: Duncan always has grade A products. Value: For what you get, the price is more than fair. Manufacturer Support: I haven't had to deal with their tech support, but I did sign up on the website and I get a happy birthday email every year, so that has to count for something right? The Wow Factor: I put them in every guitar I own - I even pulled a Burstbucker III out of my Les Paul, so that says a lot. Overall: I have been using them for almost 10 years now and I don't even look for anything else. "Adjustable pickup for any style"
Overall: I am a huge Pearly gates fan. This pick up is the next best thing. With fully adjustable pole pieces you can really fine tune your tone that you would like. It is a bit more subtle than the PG, and a little less bright, but it has a little more throaty growl to it. Cleans up very well with a roll of the volume knob. A little less "gainy" then the PG so if you're looking for a more vintage sound this works well, while still giving you enough gas for full on hard rock tones as well.